i just started picking that up actually, ive got somewhere around 30. I think I like pennies better. I don't know who changed the topic name, but coins ARE BASICALLY pennies. I'm collecting state and bicentenial quarters. I tend to like jewelry and hair pins made with "coins". Like this. 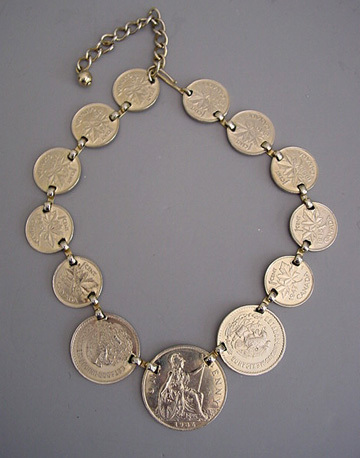 I would like to make coins with necklaces too. ....terra that is SERIOUSLY extremely pretty!!! Coins are well cool. I thought that coin necklade,or what ever it is,was yours,terra. lmao. yeah, it was a little embarrassing to get everyone's praise for that. wish i had that jewel for real. although i do have a few hairpins and other things with these kinds of decorations on them. i like these things. it's funny, during World War II copper was used for bullets, so pennies were made out of steel and silver.